THEVERYMANY proposes instead an intervention performing at the scale of architecture. This ambition to push formal complexity at large scales within limited resources illustrates THEVERYMANY’s larger approach to design. THEVERYMANY proposes a fully immersive architectural environment offering an experience of dramatic formalism. This drama is built upon an elemental perception of play. To this end, THEVERYMANY proposes an expressive piece of architecture made through ripples, bends, funnels and folds. INTEGRATION: The project investigates an integrated wall / ceiling / columnar system, shaped from surface (spatial enclosure) to structure (distributed network). The proposal deforms the discreet built typologies of the site through a unifi ed architectural system of surface and structure fusing the storefront, mezzanine and basement gallery. The pieces compresses the exterior perspective into the building blurring the distinction between inside and outside / ground fl oor and lower level. STRUCTURE: Inspired by the logic of the Monocoque, (from the French word “Coque” for “Shell” and the Grecque “Mono” meaning “single”) what is proposed is rather a sort of PolyCoque – structural continuity through skin composed of the sum of many unique and discreet elements. PATTERN : The rich technicolor pattern indexes the construction system. Assembled as a compound series of closed stiff loops, Operculum operates as a divergent investigation into the minimum resources and logistics necessary for the construction of a continuous surface paradoxically defi ned by its disintegration into pores and perforations. This logic maximizes surface affect, and minimizes fabrication and assembly time. 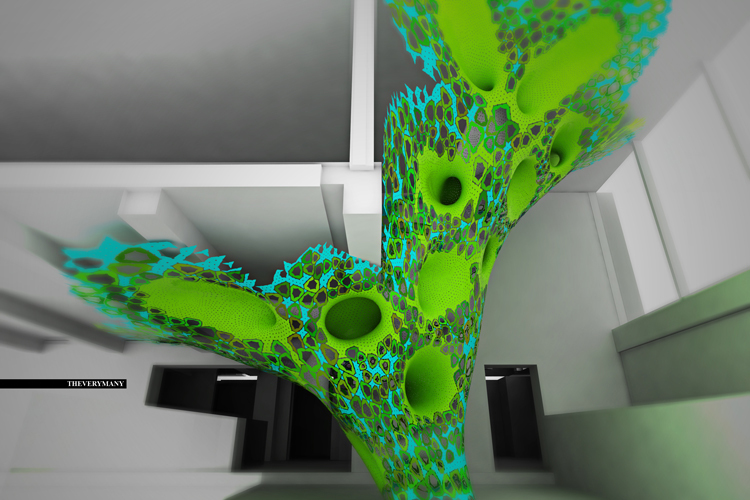 Simultaneously in and out, surface and hole, synthetic and organic, Operculum is ultimately an architectural experience which challenges logistical and creative precedent in the pursuit of more with less. 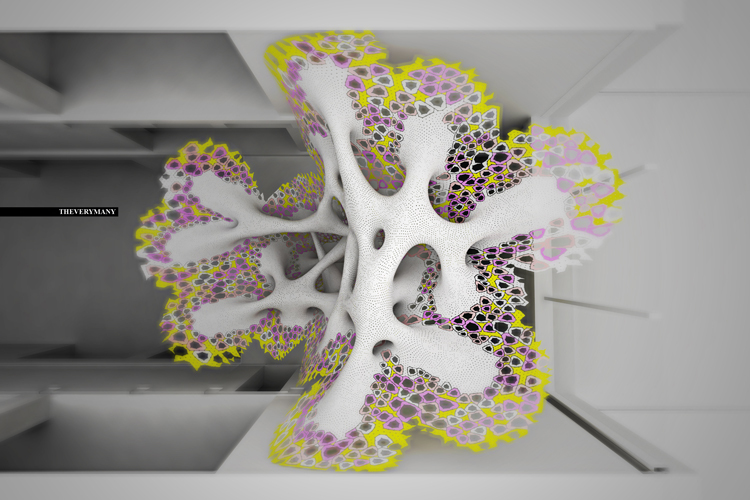 Key Words: Marc Fornes, THEVERYMANY, AIA, New York, New Practice, 2012, Mass customization, Installation, Prototypical Architecture, Computation, Scripting, Script, Python, Rhino.